Half-Past Dawn by Richard Doetsch. Non-series. Atria Books Hardcover, September 2011. This tautly-written, suspense-filled novel incorporates several interwoven mysteries. Featuring creatively drawn characters and a compelling storyline, this thriller starts quickly, keeps up the pace, and captures the reader's interest from first page to last. 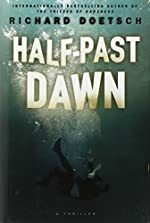 Read the full text of our review at Mysterious Reviews: Half-Past Dawn by Richard Doetsch.